The Silent Corner fits into that rarest category of books – the literary thriller – and introduces readers to Jane Hawk, a strong female protagonist thrust into a good vs. evil fight against overwhelming odds. If the product description feels like a rehash of past Dean Koontz books – hero faces off against Big Brother, End of Times, and Shadow Government conspiracies – well, you’re not wrong. But while those familiar themes are present, they are not unoriginal. In The Silent Corner, Hawk, who is on extended leave from the FBI after her husband commits suicide, discovers that nano-technology is being used to systematically eliminate a segment of the population that doesn’t share the world view of a few powerful people bent on shaping the future according to their ideals. Koontz is, as usual, observant and insightful with regard to the current state of affairs in the world – and he creates a story with purpose and meaning that goes far deeper than entertainment. In her journey to face-off with the man responsible for her husband’s death, Hawk encounters a series of like-minded individuals and behind the scene heroes who not only help her but also give her hope. It’s not just good storytelling. It’s also allegorical, and what I believe Koontz wishes for his readers. This is an amazing book. It’s an edge-of-your-seat mile-a-minute thriller that’s written by a master storyteller at the top of his game. I highly recommend it for fans of mystery, thriller and literary fiction. Use this Amazon affiliate link for more reviews and purchase options. This entry was posted in book review, fiction, new release and tagged book review, dean koontz, fiction, kindle, new release, new york times best seller, the silent corner, thriller on June 30, 2017 by tuckerelliot. A decade-plus and an additional ten books since the release of The Cleaner – the first title in the compelling Jonathan Quinn series – has seen a lot of changes for Brett Battles’ signature character and his eclectic group of specialists that live and work in the shadowy and often messy world of international intrigue. Nate began as the clueless apprentice. He would later become an equal partner and a compelling character in his own right. Orlando was the estranged colleague and lost love. She would become Quinn’s wife, partner, and the mother of his child. The Office and its enigmatic leader Peter have been dead and gone for a few books now. There is a scene in The Aggrieved, however, that gives readers hope that The Office might return in the near future. Perhaps Quinn will lead it, and Nate will be its go-to Cleaner? And for all these changes and character development that readers have witnessed in the past decade of reading about Jonathan Quinn – there’s one theme that has always been central, has never wavered, and that we clearly see front and center as events unfold in The Aggrieved: for all the evil he’s witnessed and the many terrible things he’s had to do, Quinn is the good guy. That fact allows author Battles to play harshly with readers’ emotions in The Aggrieved. Quinn has to deliver the worst possible news to his own mother – and endures words no son should ever have to live with. Quinn has to go against Helen, who is more or less one of the good guys, when he attempts to track down Dima, a character central to the last book (which set in motion the events that unfold in The Aggrieved – first-time readers, however, no worries; the author brilliantly begins the story so that you’re pulled right in and up to speed even if you haven’t read the previous book). After finding Dima, Quinn asks for her help – even though doing so will once again put Dima at risk. Yet, despite all this, what I truly loved about this book is that Quinn, at the absolute lowest we’ve ever seen him in the past decade of reading about his exploits, is proven to have been right in maintaining his “good guy” integrity throughout all the books. Countless people that live in the same shadowy world aid his pursuit of a killer – but it is their respect for him, rather than money or favors or anything else, that brings them to his aid. I think it’s a profound message for an author to be able to make in any book – but especially while writing a thriller that literally carries readers breathlessly on an edge-of-your-seat around the world journey. About his mom, Dima, Nate, and the killer they’re pursuing … and Quinn doesn’t have the answers. But in the end his true character compels him to act in a way that validates who he has been for the previous ten books, and I absolutely loved it. There were so many ways that Battles could have gone with this story – and while most of them would have been satisfying, I’m sure, he chose to push us right to the edge of Quinn’s breaking point … and then he brought us back. This is the best Quinn book since the original title in the series. It is fast-paced, unpredictable, filled with action, meticulously plotted, and boasts some of the most original characters in the thriller genre. This is an emphatic 5 stars. I highly recommend it to thriller/espionage fans. If you’ve never read Brett Battles, well, it is ridiculous how many awards he has won and it all started with this series… so get busy reading the Jonathan Quinn series. Use this affiliate link to purchase The Aggrieved on Amazon. I received a free digital edition of this book for review purposes. The review reflects my own unbiased opinion of the book’s content. I use affiliate links for Amazon. This entry was posted in book review, ebook, fiction, kindle, new release and tagged book review, brett battles, espionage, novel, the aggrieved, the cleaner, thriller on June 12, 2017 by tuckerelliot. I’m on Alex Berenson’s email list, and when he sent a message to his readers that John Wells was “back undercover in the Muslim world” I immediately went to Amazon and pre-ordered. I was excited, but also a little worried. Wells is a great character. Berenson is an incredibly gifted writer. But of late, a number of usually reliable thriller authors have used the Jack Bauer “24” method of going undercover with disastrous consequences (e.g. I have serious reservations about buying any future Scot Harvath books). I felt Berenson was right on target with his idea – I can’t imagine any fan of John Wells not wanting to read about him going undercover in Afghanistan for a second time – but I feared the worst, that Wells would morph into a bad superhero caricature and Berenson would have ruined a great series. Now that I’ve read the book, I apologize to Mr. Berenson – sorry I doubted you. This is the best post-9/11 thriller I’ve ever read. In fact, it might be the best thriller I’ve ever read, period. It begins with a CIA mission in ISIS territory. Hence, this great line from one of the operators: “better safe than headless.” After the mission, it’s clear that someone is giving sensitive intelligence to ISIS. Shafer and Wells – with support from President Duto – launch a bold plan to uncover the mole, and what unfolds is nothing short of mesmerizing. Berenson takes readers on a vivid, surreal journey with pacing and prose that are masterfully executed and a plot that is all too real and terrifying. Berenson has clearly been to Afghanistan and the other dangerous / exotic locales used in the book – for no one could carry a reader down this path so well unless he first traveled it himself. The book builds to a frenetic pace, and then Berenson cranks it up even more as it turns into a race against the clock to stop ISIS from carrying out an attack that rivals 9/11. If you enjoy thrillers, read this book. If you really enjoy thrillers that also fall into the “literary” category, then you absolutely need to be reading Alex Berenson. I used to say no one writes that category better than Daniel Silva, but I think Berenson is at the top now. Read this book – I highly recommend it, 5/5 stars. Use this affiliate link to read more about The Prisoner on Amazon. This entry was posted in 9/11, book review, fiction, kindle, new release and tagged afghanistan, alex berenson, amazon, book review, CIA, fiction, ISIS, john wells, kindle, terrorism on February 13, 2017 by tuckerelliot. UFC fans around the world were shocked with the news last year that Stitch Duran — the cutman synonymous with UFC and MMA — would no longer be working its promotions. Now fight fans the world over finally can read behind the scenes what really happened — along with many more incredible stories that have taken place since the successful debut of his first memoir From the Fields to the Garden five years ago. I’ll be posting an excerpt from the new book along with interviews with Stitch and co-author Zac Robinson in the coming days — and quite possibly I’ll give away some free copies of the new book. We’re less than two weeks until From the Fields to the Garden II! STITCH DURAN is regarded as the best cutman in the business. His first book is available on Amazon. ZAC ROBINSON is the author of many MMA and baseball books. You can find them all by visiting the Zac Robinson Amazon author page. This entry was posted in ebook, excerpts, kindle, memoir, new release and tagged boxing, cutman, from the fields to the garden, memoir, mma, non-fiction, stitch duran, ufc, ultimate fighter, zac robinson on November 20, 2016 by tuckerelliot. This is a much better book than the author’s previous contributions to the series (DEAD OR ALIVE, UNDER FIRE). One difference is Jack Jr. isn’t out to save the world — he’s just trying to avoid being killed, and to do that he hunts down the men that are trying to kill him and tries to find a logical explanation for why he’s been targeted. This allows Jack’s character to be less of a superhero caricature (as he was in the previous books) and more of a flawed good guy who is introspective and trying to find and learn from his mistakes. It makes for less action/excitement in the book, but it actually improves the overall quality of the book. Forced to work without The Campus and its resources, Jack pulls in some new allies along the way as he crosses America, Europe and ultimately Africa in pursuit of the answers he needs to stay alive. Another thing I really liked: I expected when the reason he’d been targeted was finally revealed that we’d flip back to superhero caricature mode and Jack would suddenly save the world in the final pages of the book. Well, I was so wrong. The reason is logical and compelling, and Jack’s response to it was even more so. It all leads to a satisfying conclusion. Hope this book will get the whole Campus series back on track. I highly recommend it to military/spy/thriller fans: 5/5 stars. Use this affiliate link to read more about it on Amazon. This entry was posted in book review, fiction, new release and tagged fiction, grant blackwood, jack Ryan jr, thriller, tom clancy on July 1, 2016 by tuckerelliot. Its headwaters flow out of the Tibetan Plateau along with the Huang He and Yangtze rivers in an area that is part of Qinghai Province, China. Its name is Lan Xang Jiang—literally, the “Turbulent River”—and it flows southeast through Yunnan Province and the Hengduan Mountains for more than fourteen hundred miles before it turns fully south and takes on a different name for the rest of its journey: the Mekong. Its currents are no less turbulent in Burma or Laos where the river is a line of demarcation, the place where China ends and Southeast Asia begins—but here its name has a different meaning, given by peasant farmers in Laos who depend on its waters for fish, transportation, irrigation and life. It’s an appropriate name given that the river crosses nearly three thousand miles on its journey from the mountainous terrain of Tibet to its delta in Vietnam before emptying into the South China Sea—and at various points along that path you can stand in Laos and look north across its waters into China, south into Cambodia, east into Vietnam, or west into Burma and Thailand. No matter the border, the Mekong has been an indiscriminate giver and taker of life in Southeast Asia for thousands of years. It’s a paradox like civilization’s other great rivers—be it the Nile, Indus, Euphrates, Ganges or China’s Sorrow the Huang He—for without its waters life is a daily struggle for survival; yet with its waters life is a daily bet that natural disasters and diseases will visit someone else’s village, because it’s not if, but when it’s going to happen that’s the relevant question. My first glimpse of the Mekong came from the window seat of an MA-6 at about three thousand feet as it was on final approach to Pakse International Airport. The twin turbo-prop engines and narrow fuselage fitted for about four dozen or so passengers weren’t designed to instill one’s confidence in flying—and the plane being manufactured in China was no help in that regard, either—but for someone who has never had a fear of flying the one thing that was a very real concern as the plane descended through clouds and banked hard to the right was the weather. It was summer, the beginning of the rainy season in this part of the world, and for the last ten minutes the plane had been buffeted up, down, left and right at the behest of high winds and torrential rain—but then the river came into view, and whatever worried thoughts I’d had were pushed from my mind. I stared out the window, trying to take in as much as possible, because this river, more than anything else, was a visible symbol that represented why I’d embarked on this journey in the first place: my dad survived a war that he fought beside this river; my uncle died in that same war; and now I was here because of a war, too—that other indiscriminate giver and taker of life. This new war began before my nieces were born but it continues today, even as they prepare for middle school, which means the only world they’ve ever known has been one that’s at war, and they can’t picture it in any other form. I belong to the other group—the one made up of people who not only remember how it was before but who, because of this war, have lost something along the way. Not a spouse or mom or dad or brother or sister, like so many others, but a small group of society that lost a part of our humanity all the same. When you’ve lost something that important you go searching for it. The MA-6 descended rather smoothly, all things considered—though we’d been so low flying over the river that it felt like we were making a water landing. I could see villages, boats and people whose way of life I’d known and experienced only through books, pictures, and videos, but one I’d soon walk amongst. The runway was an elevated strip of asphalt cut through a rice paddy, and the terminal was built to resemble a Buddhist temple. The plane landed and I disembarked with the rest of the passengers onto a tarmac area that was considerably lower than the runway. No doubt it was meant to facilitate the runoff of water during the rainy season. It also meant sloshing with carry-on luggage through seventy-five meters of ankle deep water. But I didn’t care about that. I stood on the tarmac as the other passengers scurried to the terminal. The sky was low and gray and I braced myself outwardly against the rain and wind. Inwardly I steeled myself for what was ahead. The first flight on this journey had been more than three weeks ago, but in reality my whole life had led me to this place. I had seventy-five meters left to cross on foot, one final passenger terminal to navigate, and a rendezvous with destiny on the other side—for at that point I would have gone as far as possible by all other means. For the rest of this journey I’d be relying on the river. This entry was posted in ebook, education, new release and tagged 9/11, education, excerpts, free kindle, laos, vietnam, war on August 26, 2015 by tuckerelliot. I was a teacher, athletic director and varsity soccer coach on an overseas military base on 9/11. 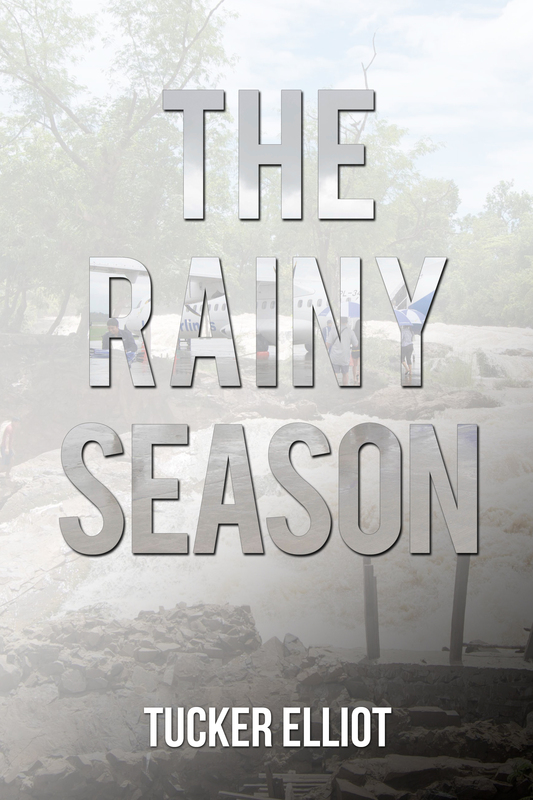 The Rainy Season is my second memoir on the subject. This excerpt is set in Korea nearly eight months after 9/11. I was impossibly young. I look back now and barely recognize the gaunt figure with the hard face. He is a stranger with a clenched jaw, dark, swollen and hollow eyes … until I see that I am flanked on either side by Sami and On-nee. Will jogged across the field and congratulated me. We shook hands like toughened, battle-tested men. After which Will had cracked a smile, and then he congratulated me a second time with half-a-man-hug, like friends do when they are done pretending to be toughened and battle-tested. … and now Ray sprinted onto the field, bursting with pride and emotion. He shook my shoulders and proclaimed, “We did it! We did it!” For emphasis he tossed in a few colorful expletives. My student-athletes—including Ray’s daughter—were in earshot. But as Ray would say, they’re military kids. They were already familiar with the vernacular. Our boys and girls teams gathered for a celebratory picture. I can still feel the icy Gatorade. It rained down on Sami and me. It’s one of the few times I can remember hearing On-nee shriek in laughter. Sami had loved it. She thought it was the single, most amazing thing she had ever experienced. I had acted annoyed. But late that night I stood in the middle of the field, alone, long after everyone else had gone home. I thought about my team, and I relished the orange stains on my jacket and jeans. I felt tremendous pride, and so much love, and my whole body began to shake with joy and trepidation. Joy, for our great achievement; trepidation, for adding three weeks to our season. Far East meant two additional weeks of training followed by a weeklong trip to Japan with more than forty military students—all during a time in which analysts offered daily assessments that mutilating American military families was at the top of al-Qaeda’s wish list. On a good night, I was sleeping three to four hours. On a bad night, I was taking two to three migraine injections. On the day before 9/11 I had weighed 165 lbs and ran twenty-five miles a week—but eight months later I weighed 147 lbs and ran thirty-five miles a week. In fact, it was the opposite. I rarely ate real food. My diet was Pepsi and Maalox. My health was deteriorating rapidly. But I didn’t take any sick days. I didn’t complain. I didn’t make excuses. My students’ parents were at war. I got up each morning and worked harder. The Sunday after we clinched a trip to Far East, I met Sami and her mom outside the Post Exchange. Julie was Sami’s mom, and I think she was the quintessential military spouse—confident, unflappable, and resilient no matter the crisis. In an evening gown she’d be elegant and flawless, but give her a gun and cammies and she could pull that off, too. Julie was tall, blond and athletic, and Aaron—Sami’s dad—had by all accounts won the lottery. On that Sunday afternoon, Julie bought fifteen kids meals from Burger King and I bought a case of grape soda from the Exchange. My phone beeped before I could answer. Our military community had four posts—one was thirty minutes away, but the main gates for the other three formed a loose triangle. If you used back alleys—and Korea is the world capital, I think, for back alleys—then you could navigate between any two points within that triangle in less than ten minutes. A large apartment complex facetiously referred to as the DoDDS ghetto was inside that triangle. I lived in the ghetto, along with many other teachers. Also inside that triangle was a tiny two-story house with a narrow yard, rusted swing set, and a beat-up ajumma cart. Sami raced ahead, toward the pedestrian gate that led off-post. I carried the grape soda and half the Burger King bags. Julie carried the rest. A fast-minute later we reached the pedestrian gate. “Bench warmer,” I said back. Korean soldiers and police officers manned the gate, along with a few American MPs. I paused a beat to look around anyway. Inside the perimeter wall was our safety zone, but outside the wall the “buddy system” was in effect—and the reason the “buddy system” was in effect is why I paused. The threat to Americans was very real. Sami took off again, like a boisterous puppy freed from its leash. I nodded. “Sure.” Sami’s parents had made plans to travel to Japan for Far East—and they had also bought tickets for the 2002 World Cup, which was being played in Korea and Japan only a few days after Far East. Sami popped me in the shoulder with a left jab and a right cross, and when the green man lit up she hit the crosswalk at a full-on sprint. “She’s going to be devastated,” Julie said, again. Up ahead was the front entrance to the market. Sami held up, but Julie called out, “You’re fine. Go ahead.” Sami raced headlong into the teeming market with its warren of dirty stalls and rancid smells. I thought, Sami, wait … but Sami and her mom had visited the orphans every week for months. The market was safe enough. I said nothing. Julie and I entered the market just as Sami jetted around a corner and into a narrow alley. I gave her my best noncommittal shrug. Julie and I made it around the corner and into the narrow alley. Sami’s red hoodie was a blur in the distance. She broke left and out of sight into yet another alley. “I know it’s been tough,” I said, wishing she would change the topic, and suddenly feeling anxious about Sami being out of sight. Julie never finished her thought. We heard scuffling and a loud clatter in the next alley, and then a man began to shout angrily in Hangul. Add THE RAINY SEASON to your Goodreads Shelf and get updated information about the release date and advanced review galleys. This entry was posted in ebook, fiction, new release and tagged education, free kindle, indonesia, korea, laos, students, teachers, the rainy season, vietnam on August 24, 2015 by tuckerelliot.